Astronomers have found a new way of measuring the spin in supermassive black holes, which could lead to better understanding about how they drive the growth of galaxies. The scientists at Durham University, observed a black hole – with mass 10 million times that of our Sun – at the centre of a spiral galaxy 500 million light years from Earth while it was feeding on the surrounding disc of material that fuels its growth and powers its activity. By viewing optical, ultra-violet and soft x-rays generated by heat as the black hole fed, they were able to measure how far the disc was from the black hole. This distance depends on black hole spin as a fast spinning black hole pulls the disc in closer to itself, the researchers said. Using the distance between the black hole and the disc, the scientists were able to estimate the spin of the black hole. The scientists said that understanding spin could lead to greater understanding of galaxy growth over billions of years. Today, astronomers with the Sloan Digital Sky Survey III (SDSS-III) released a new online public data set featuring 60,000 stars that are helping to tell the story of how our Milky Way galaxy formed. The highlight of today’s “Data Release 10” is a new set of high-resolution stellar spectra — measurements of the amount of light given off by a star at each wavelength — using infrared light, invisible to human eyes but able to penetrate the veil of dust that obscures the center of the Galaxy. Comet Of The Century? Not Yet! On September 2nd, 2012, two Russian astronomers discovered a comet designated as C/2012 S1 ISON. When the orbit was calculated, astronomers realized that the object would pass at only 1.3 solar radii from the Sun on November 28th, 2013. Numerous press articles contended that the object would be as bright as the full Moon and that in fact it could become “the comet of the century”. Dr. Ignacio Ferrin, Astronomer from the Institute of Physics of the University of Antioquia, in Medellín, Colombia, has concluded a study of the comet, using the latest observations available. Dr. Ferrin is a researcher and Faculty Member in the Astronomy Program of that Institute. 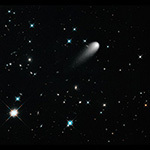 He is a recognized cometary specialist. “Comet ISON has presented a peculiar behavior”, said Dr. Ferrín. “The light curve has exhibited a “slowdown event” characterized by a constant brightness with no indication of a brightness increase tendency. This slowdown took place around January 13th, 2013. For 132 days after that date and up to the last available observation, the brightness has remained constant”. Thus the astronomer concludes that it is highly unlikely that the comet will be as bright as the full Moon. An ultra-dense (“hypermassive”) neutron star is formed when two neutron stars in a binary system finally merge. Its short life ends with the catastrophic collapse to a black hole, possibly powering a short gamma-ray burst, one of the brightest explosions observed in the universe. Short gamma-ray bursts as observed with satellites like XMM Newton, Fermi or Swift release within a second the same amount of energy as our Galaxy in one year. It has been speculated for a long time that enormous magnetic field strengths, possibly higher than what has been observed in any known astrophysical system, are a key ingredient in explaining such emission. Scientists at the Max Planck Institute for Gravitational Physics (Albert Einstein Institute/AEI) have now succeeded in simulating a mechanism which could produce such strong magnetic fields (stronger than ten or hundred million billion times the Earth’s magnetic field)* prior to the collapse to a black hole. * Strength inserted from elsewhere in the story. Galaxies, Comets, And Stars! Oh My! The sun-approaching Comet ISON floats against a seemingly infinite backdrop of numerous galaxies and a handful of foreground stars. The icy visitor, with its long gossamer tail, appears to be swimming like a tadpole through a deep pond of celestial wonders. In reality, the comet is much, much closer. The nearest star to the Sun is over 60,000 times farther away, and the nearest large galaxy to the Milky Way is over thirty billion times more distant. These vast dimensions are lost in this deep space Hubble exposure that visually combines our view of the universe from the very nearby to the extraordinarily far away.